And speaking of my wacky friends amongst the Liberal Democrat contingent, I would be remiss if I didn't let you all know about our event with their Esteemed Leader next week. 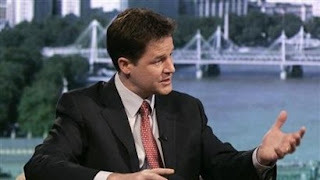 Nick Clegg will be joining Democrats Abroad members for a special one-night-only staged interview and Q&A on September 16th. This is part of our "Leaders and Influencers" series meeting with leading figures from British politics. If you aren't a Democrats Abroad Member, but you are an American living overseas, why not join? 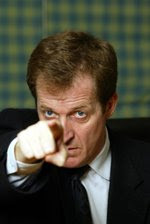 Next month (October 15th) we'll be hearing from a decidedly different political figure, the man who some call the architect of New Labour but a friend of mine calls "The Devil Himself" - Alastair Campbell. Personally I'm looking forward to hearing from both of them (and was very happy to be able to organise both) but can't imagine that the two talks will have much in common, not least because actual serving party leaders tend to be sparing with the expletives. Do you reckon we should give Alastair a swear jar? Wow. I've just had a quick look at the list of keywords that people used to find the blog and it seems like there's some sort of message there. 46 million americans without health care, how many are illegal immigrants? You guys, it would seem, have some questions! Presumably a lot of these folks found me because of this post a little while back. I notice that the post was also linked to from Lib Dem Voice recently (thanks guys). After a busy day of work today, with a client meeting in Birmingham and plenty of work to do on the train it wasn't until just before as my train was pulling into Euston station a little after 5:00PM today that I glanced at the newspaper and was reminded what todays date was. Or rather, what today's date meant. Eight years ago, working for an American owned Internet startup in South Kensington, my colleague got a call from her 19 year old son who had been listening to the radio. Something had happened at the World Trade Center. We rushed to our computers to find out more. The Internet was slow, as apparently the entire Western world was doing the same thing. I managed to get BBC news' live feed up just in time to watch the second plane hit the tower. Frantic calls home to my friends and family weren't working as the phone lines too were overstretched. Hotmail's Instant Messanger became my lifeline, checking in with everyone I could think of. When the third plan hit the Pentagon I was relieved to already have talked to my cousin - who at the time lived just a few blocks from there. And then the fourth plane, which crashed in rural Pennsylvania crashed, raising a lot more questions again - had it, too, been intended for Washington? Bizarrely, as it was all happening a woman arrived at the office for a planned meeting to talk about our international product launch that was scheduled to take place at a convention in California the next month. My boss and I took the meeting, but both she and we were distracted and unfocussed. I'm sure they were both having the same realisation I was - that this may not matter. Would we be able to travel to the States in a month's time? Were we at war? If so, with who? Were more attacks coming? If so... why? I got back to my desk just a few minutes before the second tower collapsed. Again, we were all frantically hitting the reset button to watch. By this point they were announcing that all flights in the US were grounded, and all flights to and from the US were cancelled. My boss told us all to go home - no one was getting any work done - and I got on a Piccadilly line train filled with wide eyed Heathrow refugees heading back into central London. One of the people in my car was an airline pilot with an American Airlines uniform on - someone asked him a question about how security would cope with a crisis like this, and that seemed to have opened the floodgates, as I remember how we all instinctively huddled around and peppered him with questions. I think we just needed to talk to someone in some sort of authority. Bless him, he was very patient and calm. We'll always remember that day - each of us with our own story to tell. It felt like the world was coming to an end. It wasn't. 8 years later, we're still here, we're busy with our jobs, our families, we're trying to pass health care reform (or block it), we're trying to rebuild our economy, we've got a new set of problems and a new President to (hopefully) try and solve some of them. 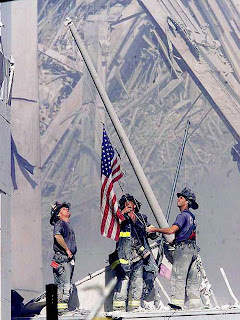 Love and hugs to all the 9/11 families today. your leadership in giving our country back its future and its truth. difficult months a happy time in my life. across decades; it has been disappointed, but never finally defeated. social justice and the character of our country. with you one last time for change and the America we can become. Tonight, President Obama addressed a joint session of Congress, urging the importance of comprehensive health insurance reform. He concluded his remarks by reminding us that, "We did not come here to fear the future, we came to shape it." Tomorrow, it is time for us to start doing our part. We need to fix our healthcare system because it is a disgrace to let 46 million Americans live in fear that if they get sick, they can't afford to be treated. We need to fix this broken system because it's unforgivable that more than 60% of personal bankrupcies in the US arise from a medical emergency - and that many of these are from people who did have insurance. We need to fix our crazy system because with lifetime caps on payouts it's possible for a 10 year old child with Leukemia to use up her lifetime quota of insurance claimes before she even enters her teens. We need to fix our system... because we can. Because it's bizarre to pretend that America has no choice but to be the most expensive health care market in the world at the sime time we are falling behind on life expectancy, infant mortality and rates of chronic diseases. We have to fix our health care system because, frankly, it's downright unpatriotic to deprive Americans of the benefits enjoyed by citizens all over the world as a basic right. Tomorrow morning, I want you to pick up the phone and call your Member of Congress and both of your Senators. I want you to tell them that you are a constituent, that you vote, that you care about this issue, and tell them why. If your legislator is on the fence, ask them to clarify their position. But do it politely. If your legislator has expressed opposition to reform, ask them politely to clarify how they propose to solve the problem of massively rising uninsured (especially as unemployment is exaserbating this problem) and unsustainbly high costs. If your legislator is a supporter of health care reform, thank them warmly and let them know you'll remember their good work on this issue the next time you come to vote.